For more than a decade, creations by Azteca Stone Works, Inc. have adorned homes, restaurants and hotels throughout California. The Concord-based bussines fabricates and installs natural stone for just about any residential or commercial application. Owner David Gutierrez combines 20 years of stoneworking skills with a drive for providing second-tone craftsmanship an services. Natural stone is durable, beautiful and enhances both the value and longevity of your property. You name it, Azteca Stone Works can make it. Let themcraft a colorful countertop for you kitchen, fashion a fabulous floor for you foyer or build a beautiful barbeque for you backyard. Azteca Stone Works has a long-term, talented crew of craftsen. They are know for being able to do thing other companies of their kind can’t such as making a marble countertop and sink all out of the same stone. 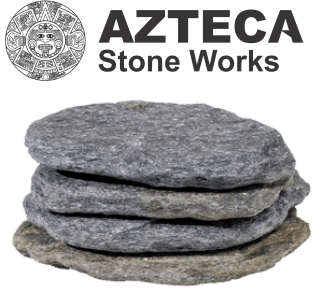 So no matter what you have in mind, you can depend on Azteca Stone Works to deliver. If you are not sure what you want, you have only to visit their Concord showroom to be suitably inspired.